Investing in loans may be confusing at first. As highlighted in our documentation, an essential part of the investment process is determining your investor’s profile. Which kind of loans do you want to invest in ? For how long ? And even more important, how much risk are you willing to take ? All these considerations can probably deter a potential investor. Fortunately, several platforms now offer easier ways to invest, focusing on the expected returns. Initially, DoFinance was the only company to offer such an opportunity. The target returns vary based on the investment duration, and this is the only choice one has to do. Returns were initially great for such an easy product; unfortunately, their new offering has lowered down the interest rates, making it slightly less interesting. In addition, the terms for early withdrawals are confusing as they depend on the investment duration. However, the competition has increased a lot since my initial DoFinance’s review. Mintos now offers predefined strategies, while Bondora aggressively pushes their Go & Grow product. In addition, I discovered Ekassa which is a platform similar to DoFinance. Is it time to switch to DoFinance’s competitors ? Let’s find out ! DoFinance offers a very simple way to invest in P2P loans. The platform has recently updated their offer; currently there are three options to choose from, depending on how long you want to invest for. The investment process itself is dead simple, and there’s no surprise regarding the final returns. However, the fine print varies regarding early withdrawal depending on the selected interest rate. I encourage you to read my complete DoFinance review for details; overall, you’ll have to accept both a penalty and some delay if you want to withdraw your funds before the planned date. Ekassa features two simple products, for a duration of either 1, 3 or 6 months. On the other hand, returns for the Profitable strategy aren’t guaranteed, but are expected to be higher : from 7% – 9% for the shortest duration, to 9% – 11% for the longest duration. The guaranteed interest rates for very short-term investments are great; for durations of 6 months and above, switching to the Profitable strategy allows to outperform most competitors. In addition, unlike DoFinance’s offer, the terms for early withdrawal are very easy to understand; the cost is 1% of the investment. Interest rates are really competitive, apart from long-term guaranteed returns which are better at DoFinance. The classical way to invest at Mintos is through the use of the auto-invest feature. While its interface is particularly well-designed, it’s still a bit complex due to the richness of Mintos’ offer. Mintos now offers three predefined strategies one can use. They’re actually custom settings for the auto-invest feature; as such, the returns may vary from the expected ones. Indeed, apart from the short-term strategy, none of these settings specify a minimal interest rate. Thus, if the interests rate offered on the platform suddenly drop, the strategy may actually invest in loans offering lower interest rates than expected. It’s also important to understand that while this offer makes the auto-investment easier, it doesn’t restrain the investor’s freedom. For example, it’s still possible to sell loans on the secondary market. 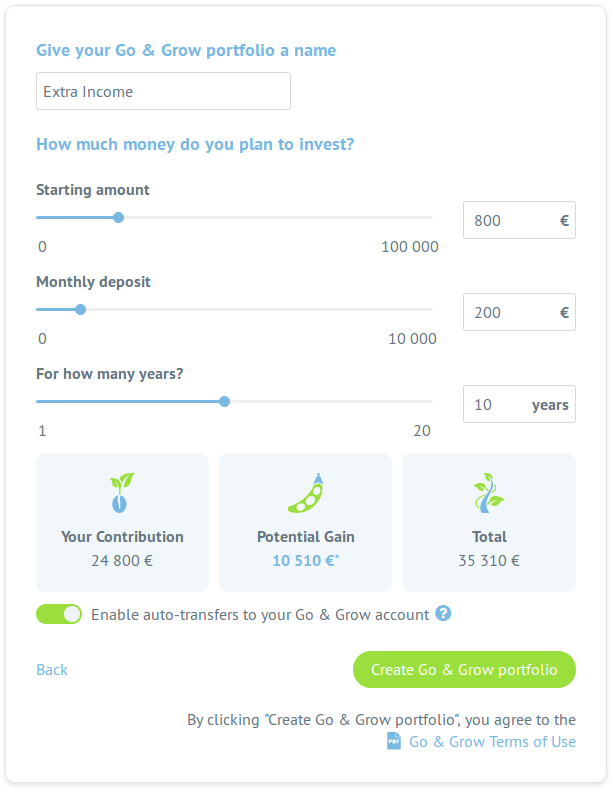 The investment criteria for each strategy are visible by clicking on “View Auto Invest strategy criteria”; this will display which loans kinds and originators the strategy will invest in, as well as the duration and interest rates range. The target diversification is also visible from this screen, by clicking on the link labeled “Diversification settings”. Bondora‘s Go & Grow is a very simple product, designed to yield 6.75%. It can be used in addition to the Portfolio manager and Portfolio Pro, or replace them altogether. It’s a very popular product among Bondora’s investors; in June 2018, 38% of the total amount invested through this company was allocated to Go & Grow. Setting up the the portfolio is easy; first you have to select the purpose of your investment (retirement, big purchase, children, travel…). Then you have to name your portfolio, and input how much you’re planning to invest both initially and as monthly additions; this allows to simulate your final gain. In my opinion, this step is rather useless, and may even discourage investors who would mistakenly think it’s mandatory to add money each month. Which offer is best for you ? Before I discovered Ekassa, my answer was “It depends”. But with this new platform, I think that it has become much easier to choose where to invest ! Investors who want guaranteed returns should choose Ekassa, excepted for those willing to invest for 6 months or more, who should still invest through DoFinance for better returns. For those who seek a probably higher but non-guaranteed performance, Ekassa seems to be the best choice for any investment duration. Does this mean I don’t like Mintos‘ pre-defined strategies ? No, but in my opinion Mintos is more suited to the more complex way of investing through auto-invest. However, the solidity and track record of the company are a great selling point. Regarding Bondora, I don’t really see a reason to invest in Go & Grow. It’s really hard for me to trust this company’s returns, so why take a risk ?